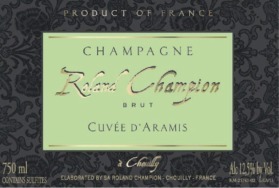 Roland Champion Champagne Cuvee Aramis Brut is made from 70% Pinot Meunier, 20% Pinot Noir and 10% Chardonnay. This non-vintage champagne is the newest addition to the Champagne Champion line. This small grower is located in the Grand Cru Village of Chouilly, in the `Cote des Blancs`. The vineyard of Chouilly has a south, southeast sun exposure, which gives the chardonnay its delicate aromas. Founded in 1951 by Andre Champion, his son Roland expanded the company by purchasing some new land, and gave his name to the family house of Champagne. François is the third generation of the family and continues in his father’s footsteps. He is the enologist and currently runs the company. He farms their 18 hectares (44.5 acres) and blends wines resulting from different parcels and various vintages to elaborate his Cuvees. The wine is aged in their cellar made of chalk where the constant temperature is 1012°C (50/54°F). Production is 85,000 bottles (7,000 cases) yearly, part of which is sold “sur latte” to negociants. The remaining 35,000 bottles are sold under their own name. Currently, all wines are 90% pre-sold to an adoring French clientele. Daughter Carole Champion represents the fourth generation to continue with the property. Juice exclusively 100% Grand Cru from Chouilly, chalky soil and subsoil. Trouillard Elexium Rose Brut NV rosé cuvée is made with 100% Pinot Noir grapes and aged for 3 years on the lees. The color is a seductive salmon pink with fine bubbles. The Pinot Noir gives this fruity wine its rich bouquet of raspberries and fresh-baked bread. On the palate it is rich yet balanced with lashings of red-berry fruitiness and an ephemeral creaminess. An enormously popular and versatile rosé, this wine is perfect with roast game birds or fowl, smoked salmon and creamy cheeses.